Rainer is Professor of Modern European History at the University of Essex and the programmer of the University of Essex’s annual Holocaust Memorial Week. 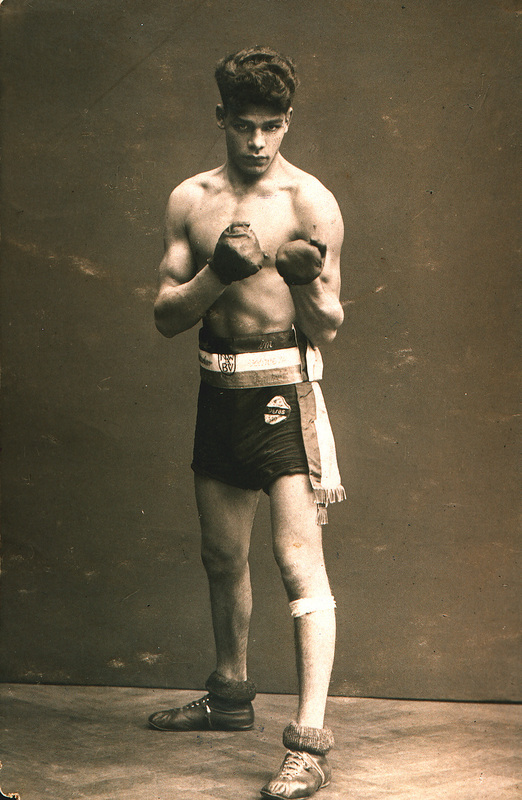 In his second blog, Rainer introduces Johann Trollmann, a popular German Sinto boxer, who was discriminated, marginalised, sterilised, and finally deported to a concentration camp where he was murdered. Johann ‘Rukeli’ Trollmann was born on 27 December 1907 near Hannover as one of nine children in a German Sinti family. He took up boxing at the age of eight, soon competing with the Heros-Eintracht boxing club in Hannover and going on to win four regional championships and a North German championship as an amateur boxer before he was 20. Boxing was a hugely popular sport in Weimar Germany, and Rukeli became famous not only for his good looks, which turned him into something of a heartthrob at the time, but for his speed, agility and technical proficiency, devising his characteristic ‘dancing’ style in the ring which is now often regarded as the beginning of modern boxing. However, in 1928 he was denied a place in the German team for the Amsterdam Summer Olympics because of his ‘non-German’ boxing style. Undeterred, Rukeli moved to Berlin and turned professional, winning 29 of his 52 fights between October 1929 and May 1933. Yet with the rise of the Nazis, the right-wing media increasingly abused him as ‘the Gypsy in the ring’. On 9 June 1933, Rukeli boxed against Adolf Witt for the German light-heavyweight title, which had been vacated by the Jewish holder Erich Seelig who had fled Germany in fear of his life. Rukeli was on course to win when the Nazi chairman of the boxing authority intervened, ordering the judges to call a ‘no decision’ and not award the title. This decision caused such an uproar among the audience that Rukeli had to be hastily crowned champion after all, but only a few days later he was stripped of the title again by the German boxing authorities because of ‘bad boxing’. A new fight was scheduled for 21 July, and Rukeli was ordered to fight in the ‘German style’ and ‘not to dance like a Gypsy’. He knew he was meant to lose this fight because he was a Sinto. Rukeli entered the ring with his face and body powdered white with flour and his hair dyed blonde: a caricature of an Aryan and a courageous act of protest against his discrimination. He just stood still and took the blows of his opponent Gustav Eder until he was knocked out in the fifth round. This marked the end of his boxing career. He struggled to fend for himself, was sent to Hannover-Ahlen labour camp twice and went into hiding for a time to avoid further persecution. In 1938, in order to avoid deportation to a concentration camp, he agreed to be sterilised under the ‘diagnosis’ of ‘congenital feeble-mindedness’. He divorced his non-Sinti wife in order to protect her and his little daughter Rita. Following the outbreak of war in 1939, he was drafted into the German army. In 1942, he was dishonourably discharged from the Wehrmacht for racial reasons, along with all Sinti and Roma, and soon after arrested by the Gestapo, severely tortured and transported to Neuengamme concentration camp near Hamburg. The camp commandant recognised him as the former boxing star and ordered him to train the camp’s SS men at night following his punishing 12-hour work shifts. Because of his deteriorating health, fellow prisoners managed to get him transferred to Wittenberge, one of Neuengamme’s satellite camps. But here, too, he was recognised as the former boxer, and was made to fight fellow prisoners for ‘entertainment’. One of his opponents was Emil Cornelius, a feared kapo. Trollmann won against him, but in a brutal act of revenge Cornelius beat him to death with a shovel in March 1944. It was only in 2003, 70 years after the original fight, that Johann ‘Rukeli’ Trollmann was finally awarded, posthumously, his championship belt.